Amy Smithson is a Senior Fellow at the Washington, D.C. Office of the James Martin Center for Nonproliferation Studies where she researches issues related to chemical and biological weapons proliferation, threat reduction mechanisms, and homeland security. Before joining the James Martin Center, she worked at the Center for Strategic and International Studies and the Henry L. Stimson Center—where she founded the Chemical and Biological Weapons Nonproliferation Project. Previously, she worked for Pacific-Sierra Research Corporation and the Center for Naval Analyses. The author, co-author, or editor of 16 books and book-length reports, as well as numerous articles, Smithson has appeared frequently before Congress and is a regular commentator in the electronic and print media. Germ Gambits is a tale of high stakes gambling in which Iraq tried to hide its germ weapons program from United Nations (UN) inspectors, risking additional punishment for breaking the ceasefire conditions for the 1991 war initiated to oust Iraq from Kuwait. At a time when common wisdom held that inspections of biological facilities were futile, the inspectors entered Iraq with scant intelligence about Iraq’s bioweapons program and were pitted against an army of Iraqis attempting to deceive them and conceal Iraq’s unconventional weapons programs. Iraq had manufactured and weaponized enough biowarfare agents to kill the world’s population many times over, so the security and public health ramifications of this situation were stratospheric. Had the inspectors not detected the program, Saddam, who had already used poison gas in the 1980s Iran-Iraq War and against his own civilians, would have retained a devastating weapon. Instead, the inspectors uncovered sufficient evidence to force Iraq to admit that it made biowarfare agents on July 1, 1995. The inspectors told the Iraqis this account made no sense, that Iraq must have also loaded these agents into weapons. Rolf Ekeus, the UN’s chief inspector, told the UN Security Council as much. Then, on August 7, 1995 the man at the center of Iraq’s weapons of mass destruction programs, Saddam Hussein’s son-in-law, Kamal Hassan, defected. Worried that Kamal would tell all to the inspectors, Baghdad rushed to spill the beans first. Page 99 of Germ Gambits picks up the story in mid-August 1995, with Ekeus hearing Iraq’s second confession in as many months. As the inspectors had suspected, Iraq had loaded missile warheads and bombs with biowarfare agents. As the account emerged over the course of a couple of days, Ekeus was not convinced that he was getting the whole story. At one point he appealed personally to Deputy Prime Minister Tariq Aziz for the truth. “I told him that he had misled me for such a long time, that he had lied about Iraq having no biological weapons. I asked him how I could trust him. Again,” recalled Ekeus, “Aziz blamed everything on Hussein Kamal.” Aziz’s reply was no surprise to Ekeus, who observed, “People have forgotten the systematic and fantastic lying by the top Iraqi leaders.” Kamal, Aziz contended, kept everyone in the dark, hiding the truth about the bioweapons program even from his closest aid, General Amer Rasheed, whose wife, Rihab Taha, ran the bioweapons program. The preposterousness of that assertion did not faze Aziz. Just after accusing Kamal and telling Ekeus he had no responsibility for the biological portfolio, Aziz claimed personal credit for withholding information on biological weapons. While the inspectors did not find out every last detail about Iraq’s bioweapons program, they successfully alerted the international community to this illicit weapons program, accomplishing what many thought was impossible. The inspectors themselves tell how they pulled off this feat in Germ Gambits, which has significant policy implications. In 2002 the international community abandoned efforts to add inspection provisions to the 1975 Biological and Toxin Weapons Convention, which bans these arms but has been egregiously violated. Among other recommendations, the inspectors argue that the international community should learn from their experience. The book’s final chapter places this tale in the broader perspective of mankind’s worrisome track record with germ weapons and the life sciences revolution now underway that could inadvertently generate additional manmade biological risks. Learn more about Germ Gambits at the Stanford University Press website. Jeanne Guillemin is a senior fellow in the Security Studies Program at Massachusetts Institute of Technology, in the Center for International Studies. She is the author of Anthrax: The Investigation of a Deadly Outbreak and Biological Weapons: From the Invention of State-Sponsored Programs to Contemporary Bioterrorism. Page 99 of American Anthrax picks up the story of the letter attacks in late October 2001, just after President Bush signed the USA PATRIOT Act and declared the administration’s “war on terror.” Two Washington, DC, postal workers, Thomas Morris and Joseph Curseen, had just died of inhalational anthrax. The US Postal Service and the Centers for Disease Control had been denying the health risks to postal employees across the board, despite clear signs that spores had leaked from three anthrax letters aimed at media targets in New York City and Boca Raton, Florida and a fourth letter, to US Senator Tom Daschle (a fifth letter, to Senator Patrick Leahy, was discovered in November, 2001). In reaction to the two deaths, the CDC pitched in to protect exposed workers, and Jack Potter, the Postmaster General, had to explain to the American public that the US mail was not necessarily safe to handle without gloves. But who had sent the anthrax letters, which ultimately killed five people, sickened another 17, and exposed thousands of others to danger? Vice-President Cheney’s belief was that al Qaeda, armed with anthrax from Iraq, was the source, and that the next attack on the United States would be with smallpox. In contrast, FBI’s experts believed that a “lone wolf” scientist had perpetrated the anthrax attacks. After five years of meticulous research, the FBI was able to match the DNA of the letters’ anthrax spores to that of spores in a flask at the US Army’s infectious disease laboratory in Fort Detrick, Maryland. Bruce Ivins, the microbiologist in charge of that flask, soon became the Bureau’s prime suspect. But Ivins’ suicide in July 2008 made it impossible to bring the case to trial. Were the letters sent by a foreign enemy or the result of a serious breakdown in US national security? The weight of known evidence points to Ivins, a troubled individual whose long-time work developing anthrax vaccines was about to be phased out, but the debate continues. Learn more about American Anthrax at the publisher's website. Lucia Greenhouse, a graduate of the Emma Willard School and Brown University, lives with her husband and four children in Westchester County, New York. I was skeptical about the Page 99 test, and then, before I even snuck a peak at my most important (my only) page 99, I felt defensive. As a first-time author, the notion that “the quality of the whole” of an arbitrarily assigned page could be a litmus test for an entire book scared the heck out of me: what if page 99 happened to be the weakest page of my book? What if it marked nothing more than a divider page, or whatever those blank pages are called? What if avid Page 99ers tested fathermothergod and decided, based on that score alone, not to read further (or, more aptly, not to flip back to page 1?) My stomach was in knots. I cursed Ford Madox Ford. But then curiosity took over. I opened, roughly, to the first third of the book, (fathermothergod is slightly over 300 pages long) and quickly found 99. I started reading. I stopped reading. I smiled. And I was stunned. The central conflict of fathermothergod jumped off the page. “I’m just going upstairs to read a bit,” she attempts to say casually, as though tonight is an average evening, not Christmas Eve. But her voice cracks, and she clears her throat. Dad follows right behind her. Olivia, Terry, Sherman, and I are left staring at the doorway. “What do you think is wrong?” I ask in a lowered voice. “She’s been upstairs practically all afternoon,” Olivia says. “She looks awful,” Sherman says. Perhaps because Terry is still new to the family, he keeps quiet. “What are we going to do?” Olivia asks. Later that night, I can’t sleep. I lie in my bed on my right side, facing the empty twin bed where my sister used to sleep. Now she is downstairs on the pullout sofa with Terry. I remember the month before, when we were at Aunt Nan and Uncle Dave’s home in Connecticut for Thanksgiving. Mom had been under the weather then too. Sherman, Mom, Dad, and I had driven out from the city together, with a stopover as usual at the Christian Science church in Pleasantville for its Thanksgiving service. Mom stood up to give a testimony, which was standard, but her words, come to think of it, were not. My gut tightens, and a feeling of panic grips me. I realize this illness may well have been going on for a while. Learn more about the book and author at Lucia Greenhouse's website. Jenny Diski was born in London, where she has lived most of her life. She is the author of ten novels, four books of travel and memoir, two volumes of essays and a collection of short stories. Her journalism has appeared in the Mail on Sunday, the Observer and the London Review of Books, among other publications. While watching the mating habits of stag beetles, Oddie narrated: 'He crash-lands on top of a likely looking lady. There's a bit of luck. One thing is sure, this boy is horny.' After a fight between two male beetles for a female, he put on a mimsy 'female' voiced and said, "Come on, big boy, come and get it." There were complaints, but, as much as the cute chicks, Oddie's anthropomorphism was a great factor in the popularity of the programme. Partly, it was the joy of watching car-crash television; partly his anthropomorphism voiced the real responses of a large proportion of his viewers. Serious zoologists are not allowed to compare animal social behaviour to human society, but everyone secretly does (doubtless even many of the serious zoologists about their own dogs and cats), and the audience rejoiced in it. But underneath the jocular misrepresentation of animals, there seemed to be a genuine bitterness, something quite disturbing, and it wasn't surprising to learn that Oddie suffers from bouts of depression. We watched as Kate, wide-eyed, ever-smiling, seemed to struggle not to let her embarrassment show on camera. The subject of page 99 is a cozy TV programme called Springwatch that gets millions of viewers each year. The passage speaks for itself. Like those millions of viewers (and Jacques Derrida who wonders very hard what his cat is thinking as it gazes up at him standing morning naked in the bathroom) I have trouble allowing animals to be as unknowable as the Lord. But I think in the end attempting to unknow animals in our own image is the best chance we have of learning to respect them and accord both ourselves and them dignity. Learn more about the book and author at Jenny Diski's website and the Yale University Press website. Donna Hicks's "Dignity: The Essential Role it Plays in Resolving Conflict"
Donna Hicks is an Associate at the Weatherhead Center for International Affairs at Harvard University. She also works as a consultant to corporations and organizations, applying her dignity model to everyday business and relational situations. The temptation to respond to a threat with a threat, to take the bait, as it were, may be an illustration of the downside of mirror neurons. Earlier in the book I described the discovery of these special cells in our brain that enable us to feel what another person is feeling. These neurons help us read the emotional experience of others. When someone else is feeling sad, these neurons automatically stimulate the same neurons in us, making us feel sad, too. It is a wonderful gift when these neurons enable us to feel compassion, to connect us with others in primal empathy. But the neurons also have the power to incite in ourselves the anger, hatred, and negativity that someone else is feeling. The natural reaction to want to lash back and defend oneself when someone had done us wrong is part of our self-preservation instincts. They propel us into action without having to think about it. The problem is, returning an indignity with another indignity makes us perpetrators. So much violence is committed when we feel we are righteously justified in returning the harm. What we don’t see at the time, because our fight instincts have taken over, is how undignified our own behavior is. In cases like this, holding back that impulse for revenge or to get even is our greatest challenge. The better part of dignity is restraint. In order to live a dignified life, we often have to hold back those instincts, such as not taking the bait, and other times, we need to assert ourselves when our instincts tell us to do nothing. For example, when someone treats us badly, we need to fight the all-too-familiar tendency to say nothing and avoid confrontation with the person who has harmed us. But there is a big difference between defending your dignity when some hurts you, and lashing back. The book illustrates how to defend your dignity without violating the dignity of the person who harmed you. The book is filled with practical demonstrations of how to honor the dignity of others, as well as how to embrace our own dignity. So many people I have worked with over the years had suffered from a feeling of worthlessness and self-doubt. This book walks readers through simple steps to recognize the many ways that we undermine our own dignity, as well as the dignity of others. Dignity has the power to turn self-doubt into a genuine feeling of well-being. It also has the power to transform relationships, even relationships that have broken under the weight of conflict, into strong, healthy, and mutually satisfying connections. The most important thing to know is this: if indignity tears us apart, dignity can put us back together again. Learn more about the book and author at Donna Hicks's website and blog. Craig Harline is the author of Sunday: A History of the First Day From Babylonia to the Super Bowl, and several other books from Yale University Press. He is Professor of History in the Department of History at Brigham Young University. Page 99 of this book, which is about how families of the sixteenth-century Reformation handled religious conversion, features a young man in California in 1973 eager to share his new Mormon faith with others. What in the world? you ask. Don’t worry, I asked myself the same thing. The Californian is there because when I first found the Reformation story that made me want to explore the topic of conversion (a story featuring a young Dutchman who became Catholic in 1654 and tore his family apart), it all sounded terribly familiar, even personal. Historians often sense personal connection to the stories they write, but I’d never had the desire to actually explain that connection in public. The past is too Other to compare easily to life now, and revealing your reasons for wanting to write a story could be really embarrassing. But just this once I wanted to say explicitly what I thought the Reformation had to do with life right now. My strongest connection with the Reformation story turned out to be the story of an old friend, whom I call Michael Sunbloom. Like the young Dutchman, he converted to a religion his family didn’t like (Mormonism). They didn’t quite disown him, but close. A typical Reformation story so far. Then came the modern twist: after three years as a Mormon, Michael realized he was gay, and quit the church. His parents were delighted that he left, but more perplexed than ever when they found out why. Yet in the end, they, unlike the Dutch family, found a way to reconcile. I decided to tell both stories, in alternating chapters, even though they occurred in different contexts and had different endings, because to me they were, once translated---or converted---the same story. I thought they would show nicely the deep connection between even the distant past and the present, and that told together they would each have greater meaning than if told alone, in the same way a conversion table gives deeper meaning both to something familiar and unfamiliar. Thus the “Conversions” of the book’s title refers not only to the usual religious sort, but to a sort of historical conversion. When an old and faraway story starts looking like one that happened right around you, then the past becomes not only more interesting, but more meaningful as well. That’s why California-boy Michael Sunbloom is on page 99 of a book about the Reformation. 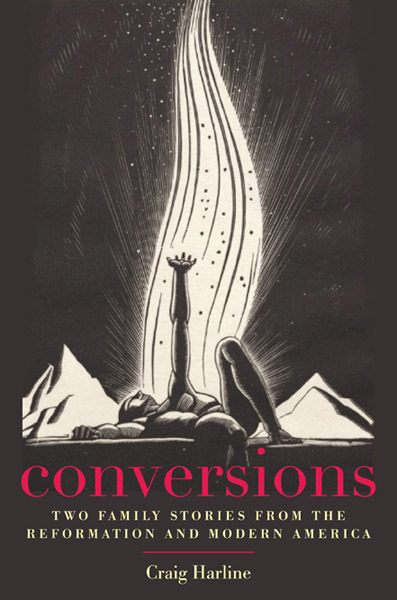 Learn more about Conversions at the Yale University Press website. Corey Robin teaches political science at Brooklyn College and the CUNY Graduate Center. His writings have appeared in the New York Times, Harper's, and the London Review of Books. Page 99 of The Reactionary Mind takes up a major theme of the book – how a quintessentially elitist politics like conservatism manages to present itself as the voice of the people – through a discussion of Edmund Burke’s Reflections on the Revolution in France. Specifically, I look at Burke’s account of the abduction by a revolutionary mob of Marie Antoinette and the royal family from the palace at Versailles. I like this page for a few reasons. First, it gives you a sense of Burke’s prose. I’ve often thought that one reason conservative thought is so fun to read is that some of its major exponents—Burke, Michael Oakeshott, Carl Schmitt—are such mesmerizing stylists. Perhaps that is also one of the sources of its appeal? Second, the page shows that far from being a recent innovation of American conservatism—which is how many journalists and scholars view it—populism was present on the right at the very beginning. In depicting Marie Antoinette as a victim, Burke manages to do for the aristocrat what Rousseau did for the commoner: make her an object of popular compassion, someone with whom we can identify, no matter how low our station. Since Burke, virtually every conservative has been searching for that magic elixir, whereby a figure of great wealth and status (paging George W. Bush) becomes an Everyman. Most important, the page demonstrates just how distinctively modern conservatism is. While Burke offers Marie Antoinette as an archetype of classical tragedy, I point out that in tragedy “the most any hero can hope for is to understand his fate: the wheel of time cannot be reversed; suffering cannot be done.” Yet Burke clearly wants to undo the fate of the royal family (at the time of his writing, they had not been executed) and indeed of the French Revolution as a whole. His is not a stoic appraisal of historical irreversibility but a radical and revanchist call to arms, an exhortation to repeal the verdict of time. Once again demonstrating that the radicalism and revanchism of the contemporary American right is anything but novel. Learn more about The Reactionary Mind at the Oxford University Press website. E. Paul Zehr is a professor of neuroscience and kinesiology at the University of Victoria, British Columbia, and the author of Becoming Batman: The Possibility of a Superhero and the newly released Inventing Iron Man: The Possibility of a Human Machine. However, the neurons in the somatosensory cortex still do exist and are expecting and awaiting information from the body. There can be an “expansion” of the maps such that areas that were nearby the now- disconnected brain regions take over and make use of the neurons in the old area. This means that there is remodeling of the cortical maps and is a useful response to accommodate the needs of the nervous system. Your nervous system doesn’t like to have a gap in the map of the relationship between the body and the brain. One odd— but not uncommon— effect of missing limbs is phantom limb and the related phantom pain syndrome. Sometimes the representation in the brain of the amputated limb does not fade away and gets taken over by some other areas and instead persists despite the limb amputation— enter the phantom limb. People suffering from phantom limb syndromes can have the distinct sensation that the limb exists and is there. They can feel itching and tingling and perceive weight in the limb, the exact opposite feeling of a leg that has fallen asleep. Phantom limb syndrome would be merely a nuisance if it were all there was to losing a limb. Unfortunately, what oft en goes along with it is a phantom pain syndrome. This means exactly what it sounds like: the person feels painful sensations that seem to be coming from a limb that no longer exists! As you might guess, this is a very troubling thing to experience. How can you treat pain in a limb that doesn’t physically exist? The work of Vilayanur Ramachandran and colleagues at the University of California at San Diego has taken an interesting approach to this— by tricking the brain into thinking the missing body part does exist. If a split mirror is set up (often a “mirror box” is used), someone sees the other side of their body on the mirror side. Figure 6.1 shows me using a mirror box at the lab of my friend Richard Carson at Queen’s University Belfast in Northern Ireland. Notice that it appears from the reflections that I have two arms, but one is the reflection of the other. My other arm is hidden behind the mirror. This has been used with amputees with phantom limb syndromes, including phantom limb pain, to treat the symptoms. If participants carefully study their movements and do different tasks with the intact limb while looking in the mirror, they will perceive that the amputated limb is actually moving and feeling sensation. This excerpt is from page 99 of Inventing Iron Man: The Possibility of a Human Machine. I think it represents fairly well the quality of the writing in my book, but does happen to fall right in between discussions of “Iron Man”. Throughout Inventing Iron Man the suit of armor is used as a metaphor for the ultimate “brain machine interface”—a technological interface bridging the gap between our nervous systems and devices like computers and robots. This extract comes from Chapter 6 “Brain Drain—will Tony’s gray matter give way?” where the main focus is on the effects that habitual use of the Iron Man armor would have on the nervous system of the user—Tony Stark. Just after this excerpt I address what I consider the most bizarre and intriguing outcome of this line of thinking. As the excerpt outlines, plasticity in brain maps is well known after traumatic injuries like limb amputations. In that case brain regions take up the function of areas not in use because the body part is missing. This frames the idea of what would happen when using a device like the Iron Man armor. But there is one huge difference. In the case of using the armor in a person who hasn’t had an amputation, THERE ISN”T ANYTING MISSING! So where does the armor go? I ask in a later section “Is there space in Shellhead’s brain to store a skin of iron?” It’s posed as a funny question. 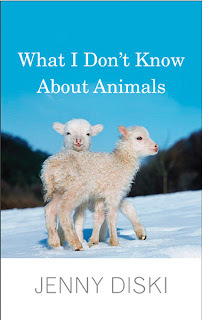 The truth is, as I discuss in the book, we don’t know. This is not a natural event, interfacing with machines and computers. We have no clear understanding of what such interfacing would do—long term—to the biological human connected to the technology. This, of course, is the main issue pulsing in the background of Inventing Iron Man…where is the line between human and machine? Learn more about the book and author at the official Inventing Iron Man website. 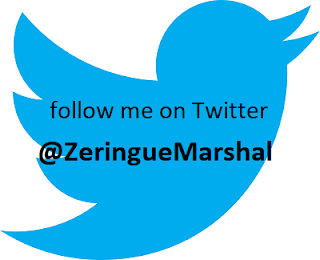 Writer's Read: E. Paul Zehr. Timothy Wilson's "Redirect: The Surprising New Science of Psychological Change"
Timothy D. Wilson is the Sherrell J. Aston Professor of Psychology at the University of Virginia. He has written for Science and the New York Times, among other publications and journals, and is the author of Strangers to Ourselves, which was named by the New York Times Magazine as one of the Best 100 Ideas of 2002. Wilson is also the coauthor of the best-selling social psychology textbook, now in its seventh edition. I’m afraid that the Page 99 Test didn’t fare very well with Redirect: The Surprising New Science of Psychological Change. That’s because it lands the reader right in the middle of a story—in this case, the description of a psychological study on the value of labeling kids’ feelings, which won’t make much sense unless you read the lead-up to the study on p. 98. I think my book can be browsed profitably, however, by opening it at different points (perhaps after reading Chapter 1). The book covers disparate topics—personal happiness, parenting skills, adolescent behavior problems, and reducing prejudice between groups—but with a common theme. Redirect is about stories in a couple of different meanings of that term. First, it is full of stories about real people and how they live their lives. Second, it is about psychological stories, the narratives that people tell themselves about who they are and why they do what they do. Often these stories serve people well. A major reason why people are unhappy or get into trouble, though, is because their stories have taken a negative turn--people are too pessimistic or make unflattering assumptions about themselves and the people around them. The question then becomes, how can we help people out of these negative thinking patterns? How can we redirect their thinking so that they tell better stories about themselves? One way is through psychotherapy. Cognitive behavioral therapy, for example, is an effective way of helping people develop better thinking patterns, especially those with serious problems such as depression or anxiety disorders. But social psychologists have discovered another approach that I call story editing. It is a family of techniques that help people redirect their stories in beneficial ways, leading to sustained change. It involves giving people prompts about how to interpret their behavior in healthier ways, getting people to change their behavior first as a way of changing their stories, and writing exercises that people perform on their own. These techniques have been shown to improve people’s lives in all of the aforementioned ways, such as making people happier, improving parenting skills, and reducing adolescent behavior problems. How do we know? Because each of these techniques have been tested with rigorous scientific experiments (such as the one described on p. 99). Indeed, another theme of the book is that any intervention must be tested empirically; too often, policy makers put programs into place before they are tested, only to discover that they are ineffective or worse, do harm. Fortunately, there are many proven story-editing interventions that work. Pick up the book and turn to a random page, and you will see how—though you may have to back up a page or two to get to the beginning of the story. Learn more about Redirect: The Surprising New Science of Psychological Change at the Little, Brown website. Zachariah Cherian Mampilly is Assistant Professor in the Departments of Political Science, International Studies, and Africana Studies at Vassar College. How do past events shape contemporary political realities? In our post-modern age, it can seem that history is just a battleground of interpretations. We’re taught, correctly, to question the source of any historical ‘fact’—that the interpretation of any event reveals more about who is doing the interpreting than an objective reality. As Chuck D explained to me long ago, we all need to learn the difference between history and ‘His Story’. But history is more than putty for political entrepreneurs. Past events linger unevenly, uncontrollably, despite efforts by those who would twist them to advance particular political agendas. One thing I learned while researching my book is that predicting the influence of the past on the present can be a fraught task. History is always prone to manipulation. Nationalists around the world selectively highlight events, stringing together disparate moments into narratives of glory or oppression to suit their particular need. But the past also lives on in the daily actions of individuals. It shapes their reaction to authority, their conception of the enemy, their reaction to a foreigner walking in their midst. It can be read in the furtive stares of Tamil civilians walking past a Sinhala checkpoint in Sri Lanka; in the flash of contempt across the young faces of South Sudanese staring at the equally young aid worker driving through their village in a $50,000 vehicle; or in the blank expressions of eastern Congolese as they realize that as an academic, I come for their stories with nothing to offer in return. But page 99 was a perfect choice in its own way. Much of the book is concerned with understanding the continuities and disjunctures produced by an outbreak of political violence. One of the key arguments I make is that there are no truly revolutionary moments, no clean breaks from the past, no tabula rasas. The past always lives on in configurations of social and political order. Not in the pithy and opportunistic manner ascribed to it by nationalists, but in surprising and counter-intuitive ways that have real importance in explaining why certain societies fracture, and just possibly, how they can be healed. Learn more about Rebel Rulers at the Cornell University Press website. Jon Reiner is the author of the debut memoir, The Man Who Couldn’t Eat. The book is based on a story of the same title he wrote for Esquire which won the 2010 James Beard Foundation Award for Magazine Feature Writing, was nominated for a National Magazine Award, and was translated into multiple languages for international publication. I must lick this French fry. It’s calling me, and I have no choice. I'm not asking to eat the fry; that would be a mess. I just want to lick it. Taste its salt. Have it in my mouth and melt into me. Just a taste, man, that’s all I need. I’m standing in our kitchen now, home from the hospital—hiding, actually, from Susan and the boys at the dinner table—wooed to the stove by the smell of cooked hamburgers and french fries. The smell should be a draw to a real meal, the satisfying act. In the sensuality of eating, the nose teases and the mouth consummates. The intensity of the dinner’s aroma is playing havoc with my senses, as so many smells have lately, and I’m transported. The chestnuts smelled like this. Ford Madox Ford’s p. 99 belief is a shade more generous than the dictum once told to me by a literary agent considering a novel I’d submitted: “I only read the first paragraph. Then I make my decision.” In the case of my memoir, The Man Who Couldn’t Eat, I’m fortunate by the slimmest of margins. Page 99 starts a new, and pivotal, chapter in the story. Page 98 is a blank divider. What I’m doing in my family’s small apartment kitchen in p. 99 is jumping dangerously into an abyss. It’s the start of the bottom curve in the story’s arc, and things will get much worse before they get better. In the complicated aftermath of life-saving emergency surgery for a ruptured gut, I’m on a “Nothing-By-Mouth” prescription: All food and drink have been restricted for months, and I’m “fed” by a food pump 18 hours a day, hoping for my condition to improve so I can return to the global table of eaters. At desperate moments like the one on p.99, hope mixes with fantasy, and I tumble further from family and friends and the normal life I knew. Food is the body’s second-greatest pleasure, but its absence in my life had dire consequences beyond the physical. The psychological, emotional, social, and cultural dimensions of food, and the impact of living without it on my identity, marriage, parenting, career, and desire to live are at the core of the story. Food is the sustenance of my personal history, a destination where the remembered smell of chestnuts will lead me. Food is both the driving force of the narrative and the means to explore the essence of life. Craving to lick the french fry, I’m at a crossroads. Desire and craving are life-affirming impulses. Cravings are the sharp hook on to your personality, the expression of your essential self. I want to stop the erosion of a person who has been diminished by half and is at the risk of disappearing entirely. But when my wife and kids discover me in the kitchen, they’ll see a frightening act committed by a stranger in their home. At that instant, finding a way out of the abyss does not seem possible. Learn more about the book and author at Jon Reiner's website and blog. David Edgerton is the Hans Rausing Professor at Imperial College London where he was the Founding Director of its Centre for the History of Science, Technology and Medicine. He is the author of the iconoclastic and brilliant The Shock of the Old: Technology and Global History since 1900 (Oxford, 2007). Opening my book on p. 99 I find I say that during the Second World War, Winston Churchill ‘took a personal and direct interest in this vital matter’ of production. Lord Lindemann ‘was his trusted adviser on all the material aspects of the war effort. Lindemann’s almost daily minutes to Churchill give an interconnected story of things and experts, little of which is reflected on the vast literature on both’. My book is such a history of things and experts in Britain during the war. It breaks with most writing on this well-rehearsed topic in many ways. There is a long standing understanding that Churchill concentrated on matters of strategy, while matters of production, of the Home Front, were the domain of others, especially of the Labour Party members of the coalition government. There is a suggestion too that Churchill was a figure from the past, concerned at best with gadgets, and that Lindemann was a dangerously cranky scientific adviser. In my account, conservative Britain rearmed powerfully before 1939, was deeply committed to modern ways of war, a commitment which became if anything even stronger under Churchill. Such a commitment implied interest and control over that most vital of aspects of modern war, production. My history is one of a strong warfare state, by many measures the greatest in the world in 1940-41. The point was however that power in production did not necessarily always mean power in the field. Britain’s lead in production and machines did not translate into victory. Unfortunately, British intellectuals, politicians, and later historians believed that such a direct link existed, and blamed supposed failures in armaments for defeat in the years 1940-1942. This is just one way I revise our accounts of how Britain fought the second world war, a story focussed not just on the British isles, but one which sees Britain not merely as an imperial but as a truly global power, able to rely on the rest of world for vital supplies. Wartime Britain was never alone, and was always strong. That strength came at least in part from the character of its ruling class, not its supposed usurpation in matters of production by the left. The Page 69 Test: The Shock of the Old. Writers Read: David Edgerton (May 2007). Writers Read: David Edgerton (September 2011). Simon Garfield's "Just My Type: A Book about Fonts"
Page 99 concerns John Baskerville, an 18th Century pioneer whose font you can still select from your pull-down menu. Baskerville worked in Birmingham, England, and he came to type design quite late - he paid his bills by doing lacquer work and engraving headstones. But he was a book lover, and his desire to publish beautiful volumes of Milton and invent new types almost bankrupted him. His books were criticised for being too shiny (not a complaint one hears much today), and they were littered with errors. But he did make one stunning typeface in a variety of styles, and it remains clear, concise and usable for any projects where a traditional mood is required. We can recognise the Baskerville font today by one letter alone: its magnificent Q [inset, left]. 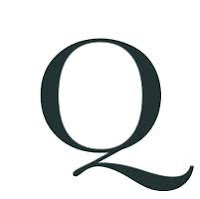 I often think of type designers expressing their real creative emotions with their ampersand and their Q, and Baskerville is a prime example. The tail flits a little to the left and then much farther to the right, varying its thickness. It looks rather like a squirrel's tail, and when used today swiftly establishes an air of grandeur and authority. Page 99 is partly occupied with an illustration of this Q, and with the story of a German fan who had travelled to see Baskerville in 1775, but met with discouraging news: 'Only on my arrival did I learn that he was buried more than six months ago.' We learn that King George III was a big fan of Baskerville's font, and that Baskerville's widow was willing to sell his printing press and all of his metal type for £4,000, something of a bargain. The page is partly representative of the book as a whole (in so far as it tells a neat story), but the majority of the book is concerned with the history and use of more modern examples, from Futura and Gill Sans to Helvetica and Gotham. Not that Baskerville is a relic. Hilary Clinton used it in her 2008 campaign, and it is still a highly influential classic. Learn more about the book and author at Simon Garfield's website. 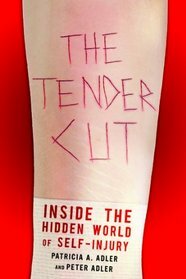 Patricia A. Adler and Peter Adler's "The Tender Cut"
Self-injury, which has gone by several names including self-harm, deliberate self-harm syndrome, self-mutilation, self-cutting, self-injurious behavior, and self-wounding, emerged from obscurity in the 1990s and spread dramatically as a typical behavior among adolescents. Our research, just published as The Tender Cut, offers the widest base of knowledge about this behavior, grounded in ten years of over 135 in-depth life history interviews with self-injurers located all over the world and tens of thousands of Internet messages and emails. You might feel alone in your self-injurious activities. This may be due to the fact that you previously did not know anyone else intentionally hurt themselves. Self-injury is a behavior that’s rarely discussed in society and has not been exposed by the media; and for these reasons you might have felt alone. You may feel different or “crazy” or abnormal. You may feel shame about your self-injury because you have not yet realized that there are other people who also hurt themselves. But in the late 1990s and the early 2000s, self-injury began to spread to a wider population and take on a whole new meaning. Celebrities came out about their behavior, and forums on the Internet arose where people could express a hidden but highly emotional side of themselves, one that they could not share with friends or family members. The Tender Cut describes the transformation of this behavior from one practiced by loner deviants in hidden and stigmatized ways to one that has “come of age,” supported by Internet subcultures and support groups. The host of Internet self-injury subcultures hold different norms and values, like most deviant subcultures, and stratify themselves along a continuum of acceptance toward self-injury. These sites offer not only help but an alternate to the psycho-medical community’s model of self-injury as pathological. They aid people in realizing that this behavior does not mean that they are crazy, weak-willed, sick, or bad. In fact, our longitudinal data show that many people who struggle with self-injury during their formative years, like those who try drugs, eating disorders, or delinquency, grow out of it to live fully functioning productive lives as professionals, parents, spouses, without further problems. Learn more about The Tender Cut at the NYU Press website. An eminent historian of film, Steven J. Ross is recipient of the Academy of Motion Picture Arts and Sciences' Films Scholars Award and author of the prize-winning book, Working-Class Hollywood: Silent Film and the Shaping of Class in America. Page 99 only hints at one of the major themes of the book: Although the Hollywood left has been more numerous and visible, the Hollywood right has had a greater impact on American politics. The Hollywood left has the political glitz, but if we ask who has done more to change the American government (and dismantle the welfare state), the answer is the Hollywood right. During the postwar years, Hollywood conservatives—led by George Murphy, Ronald Reagan, Charlton Heston, and Arnold Schwarzenegger—sought, won, and exercised the kind of electoral power that liberals and leftists dreamed of but never achieved. Read more about Hollywood Left and Right at the Oxford University Press website. Cathleen D. Cahill's "Federal Fathers and Mothers"
Cathleen D. Cahill is assistant professor of history at the University of New Mexico. Julia DeCora (Winnebago/French), an Indian Service nurse, received a letter of support that used similar imagery; ‘It appears that the wife of the superintendent who has now left there, [s]ingled Miss DeCora out for slaughter…. [I]f that Superintendent’s wife had remained at Tower much longer there would not have been any school left. She was a shame and a disgrace to the service…. It seems that the Superintendent was all right, but his wife was a hellion.’… By 1928 the Indian Service rules included a provision stating that bad behavior on the part of employees’ relatives was cause for termination. While this page primarily focuses on the adversarial relationships, the social world of the Indian Service also became a site of friendship, admiration, and sometimes romance across those same lines of race, class, and tribal affiliation, which I explore in later chapters. These interactions among the employees, as well as between the employees and the Native people among whom they worked, form the heart of my study and are well represented on page 99. But in order to understand the conditions under which the government developed such a unique workforce for the BIA, I framed their stories with a discussion of how administrators developed assimilation policies. I argue that they used a strategy of intimate colonialism—attempting to change the fundamental nature of familial and social systems through the regulation of individual relationships—to develop and staff assimilation programs. Without that frame, the government’s hiring of married couples comes off solely as nepotism instead of a key ideological strategy. Thus my book presents a new angle on the policy history of this period by infusing it with the stories of employees on the ground and demonstrating how their experiences shaped the reality of those policies. Learn more about Federal Fathers and Mothers at the University of North Carolina Press website. Aden Kumler is an assistant professor in the Department of Art History and the College at the University of Chicago. The German art historian Aby Warburg was fond of saying “God is in the details.” Having spent a decade looking at diminuitive, yet breathtaking paintings in medieval manuscripts, I am convinced that Warburg got it right. Putting my recent book, Translating Truth: Ambitious Images and Religious Knowledge, to Ford Madox Ford’s “Page 99 Test” I wondered what I’d find in its details. Acting as a fictive and idealizing mirror of Christian society, the compendium’s initials visually describe a community unified in its relationship to religious knowledge, yet still possessed of the marks of social distinction. Was the manuscript’s original owner enlightened by the didactic lumere of its texts and dazzled by the illuminated letters that grace almost every recto and verso? Certainly, the compendium mounted an ambitious campaign of solicitation, inviting the reader-viewer to join a company of men and women distinguished by their stature on the page and by the authorizing texts they inhabited. As the book owner voiced the words inscribed on a recto or paused to inspect a painted face, the dialogic question and answer of the Lumere’s text amplified, proliferated, and swelled into a polyphony of imagined voices and gazes. In this volume, the dialogic practice of spiritual reformation was figured as a sociable affair, a collective undertaking that welcomed the manuscript’s owner into a garrulous community of religious knowledge and worldly distinction. 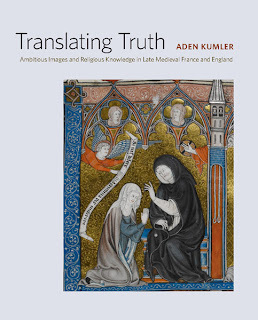 Here, as in the rest of the book, I challenge the persistent myth that medieval lay people had an intellectually unengaged, submissive relationship to religious truth and authority. If we look carefully, I suggest, we can see how elite medieval men and women passionately pursued religious truth—and a relationship with the divine—in all the beautiful details of their illuminated manuscripts. Learn more about Translating Truth at the Yale University Press website.